It’s been a very long time since I took the time to write a post. It’s 2014. New Year. Suitcases packed and I’ve been on the road again to the Caribbean. Anguilla, a small magical island in the Eastern Caribbean, has stolen my heart. The island is tranquility wrapped in blue, and every time I travel to Anguilla, the place feeds my soul. What makes it so special to me? Option 1: Fly to St. Maarten (SXM). Nonstops from Atlanta, New York, Newark and Miami (American Airlines, Continental, Delta, Jetblue, and United). Take a 12 minute public ferry from Marigot or private charter boats from Princess Juliana Airport. Option 2: Fly directly to Anguilla (AXA) Clayton J. Lloyd International Airport via Cape Air, Liat, or private jet. Limited flights via San Juan and St. Thomas. High Season: December 15 thru Mid-April. Hotels: Viceroy Anguilla, Cuisinart, and Cap Juluca are top luxury resorts. Lots of private villa options. Nightlife: Elvis Beach Bar, Pumphouse, The Dune Preserve, Johnno’s, and Dad’s are all top spots for dancing and reggae bands on Friday and Saturday nights. Roaming with US cellphones is expensive, texting and internet are more affordable options to stay in touch. The secret to Anguilla: Hidden paradise….ultimate place to relax and rejuvenate. I highly recommend Anguilla for an unforgettable vacation. Just GO! How to Get There: Nonstop flights offered from Atlanta, New York, Miami, Minneapolis, and Newark. Carriers include: Airtran, American, Continental, Delta, JetBlue. Average flight time 3-4 hours. 1. Prearrange transportation to/from the airport (cabs can be expensive). 2. Carry cash for $10USD Tourist Card fee (per person for both adults & children) paid upon arrival. 3. Brush up on basic Spanish phrases (you will need them). 5. Eat carefully (I tended to only eat cooked foods, no salads or uncooked veggies). 6.Carry plenty of sunscreen (sun is intense and most resorts have limited palm trees and shade). 7. Secure dining reservations at top tier restaurants upon check in. 8. Allow 3 hours for airport check-in when leaving the island. The secret of the DR: Vacation on any budget. The place to relax. Nightlife: Elvis Beach Bar, Pumphouse, Johnno’s are all top spots for dancing and reggae bands on Friday and Saturday nights. How long were you there: 2 days (December 2011). Why did you go? Weekend getaway. How did you get there? Nonstop flight from Atlanta. What travel tips would you offer? Don’t eat prior to your trip:) Get plenty of sleep prior to arrival, you will not sleep much in New Orleans. Bring very comfortable walking shoes. Cabs rides between the airport and Bourbon St/French Quarter tend to be pricey, bring cash with you. Hotel: Drury Inn and Suites New Orleans. What did you do? Eat. Drink. Eat. Drink. Lots of sightseeing on Bourbon Street and the French Quarter. This was especially great: To die for seafood at Deenie’s (restaurant) off Bourbon Street. The BBQ shrimp in a spicy butter sauce served with fresh french bread was so darn good. Gumbo from the Red Fish Grill. 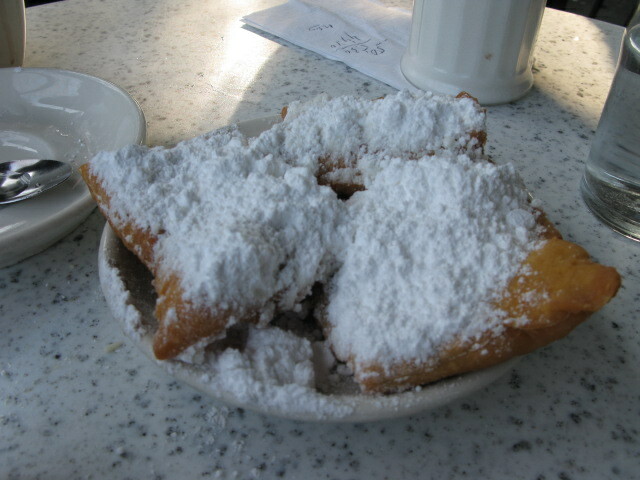 Mouth-watering beignets at Cafe du Monde (bistro, French Quarter). Sweet potato pie from Lorraine’s. 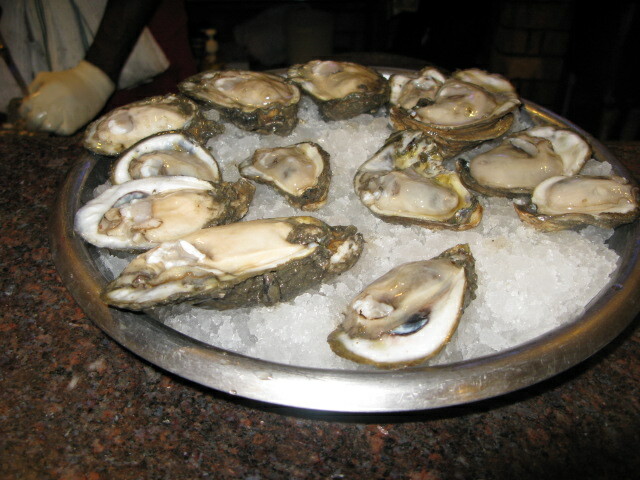 Oysters from Felix’s. Drury Inn and Suites was in a great location, very affordable, clean, and courteous staff. This wasn’t: Traveled during December, prior to Christmas. Bourbon Street was quiet. Favorites: Seafood. Oysters. Gumbo. Beignets. Pralines. Bread pudding. Would you go back? If so, what would you do differently? Of course! Longer stay. Any surprises? Due to the time of year, Bourbon Street was unexpectedly quiet. What was your Kodak moment? So many of these on Bourbon Street….too many to name. Plane-watching in St. Maarten…the coolest. 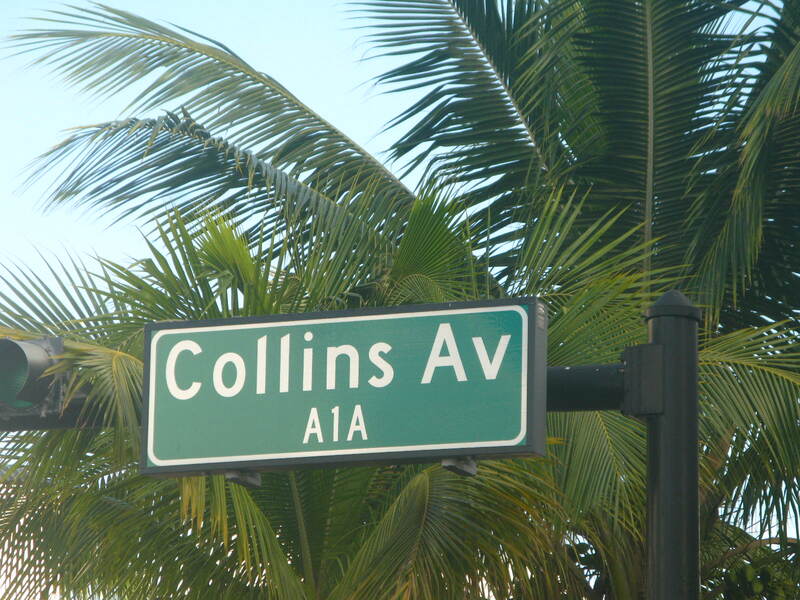 Calling all aviation geeks…..I will start by sharing one of my favorite things to do. Plane-watching. It does not matter where or when, plane watching is so much fun. As I mentioned, I worked for an airline for over 17 years, and there is nothing I enjoy more than watching a takeoff or landing. It’s even more thrilling watching up close and personal. I’ve actually had the opportunity to fly a 757 in a flight simulator, sat in a real cockpit (while aircraft parked), walked the ramp, and watched a crew paint a 777 from start to finish. But one of the best places to catch runway action is in St. Maarten, at the world famous Princess Juliana Airport. The place to be or be seen is the world famous Sunset Bar and Grill at Maho Beach in St. Maarten. It’s an aviation geek’s dream, no other airport rivals this spot. Crowds gather daily from all over the world, with cameras and cellphones in tow, ready for that great shot. My personal favorite is the arrival of KLM’s 747 from Amsterdam. You can catch a range of very large (747s) to very small (turboprops and private planes) planes on a daily basis. The real thrill seekers get very close to the runway, hold on to the fence during takeoff, and catch the jet blast, which can be very dangerous. The sand blast is powerful, the engines are noisy, but it’s about as cool as you can get. All I can say, is JUST DO IT!